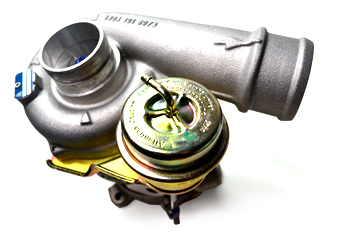 A Hybrid Turbo simply means a non-standard or potentially upgraded turbocharger. This consits of a turbo with combined parts from different frame sizes and potentially different manufactures, such as Garrett or BorgWarner to make the ultimate performance turbo. There are many variants of the hybrid theme ranging from a turbo with only one component changed or modified through to one with all the components being changed or modified in some form or another, therefore there are no hard and fast rules on hybrid turbo designs or the performance you can achieve… it's a bit like a modified engine, it looks the same from the outside but is crammed full of more exotic material and higher flowing components on the inside. (Quick tip, to gain a much better response and an increase in power, convert your turbo to a ball bearing turbocharger especially on a road car. The non ball bearing units often compromises with response versus power. More power and torque for the same given displacement equals more lag. The basic idea is to get more flow from the turbocharger at a given rotor speed… this can be achieved in various ways from larger or more efficient compressor wheels, higher flow compressor covers with a larger A/R, cut back turbine blades and larger A/R turbine housings etc… Simply “winding the boost up” is not the answer. Yes, in most cases it will give you more power but what are you doing? If you take a standard turbocharger and increase it’s boost pressure output you are doing two things that are or can be detrimental to the turbo and/or engine. Firstly, you are making the turbo work harder/spin faster to make that extra pressure. The turbine is rated to rotate at a maximum reliable speed. Spinning it faster could take you outside that zone and then you can run the risk of turbine blade failure. Running the compressor wheel faster will certainly give you more flow and pressure but at the expense of a lower efficiency and therefore a higher charge temperature. This can cause a higher likelihood of pre-detonation and limit power output. A hybrid turbo, if designed properly, will allow the extra flow and pressure to be achieved at a safe and reliable turbine speed and at higher compressor efficiencies. So, more flow means more air, hopefully at a cooler temperature, which you can then add more fuel to and hey presto… more power! Many people including some tuners become obsessed with ‘boost’ whereas the reality of professional tuning is all about flow through the engine. But be warned not all hybrids are that good, there is usually a trade off for all this performance gain… lag! !… (Excluding the latest ball bearing & Variable Nozzle Diesel turbos). It is very difficult to get improved performance/response all through the rev range with a standard journal bearing turbo and still get big output at the higher end of the rev range… that isn’t to say it can’t be done, it can be with careful design but on the whole there has to be a compromise… We will always give you honest advice, not sell you up and then have you disappointed or upset. If you’re a person who likes to shop around and you find wildly differing prices, be warned, whilst there are occasionally bargains around when buying turbochargers, with Hybrids you do pay for what you get. Find out exactly what you are being offered for your money.